I have recently gone through my nail varnish box and decided to pick out a few of my favourites to show you all! The first is my Nars Base Coat. It is very easy to apply as the brush is quite rounded and smooth and the thickness and shine is amazing! The second item is my Chanel Le Vernis Nail Colour in Tutti Frutti. The colour is so gorgeous and I absolutely adored this over summer. The consistency is perfect and it leaves a glossy shine. Next is my Paul & Joe Nail Polish in the colour 20. I have fallen in love with the look of Paul and Joe's products and this nail varnish bottle is so adorable. The shade of pink is slightly darker than usual pink shades and I think it looks very elegant. Another elegant nail varnish of mine is the Estee Lauder Pure Color Varnish but in Negligee. The matte finish is very chic and neutral. My next nail polish is the Max Factor Gel Shine Lacquer in Glazed Cobalt. This colour is fun and bright, and the gel texture means it is very long lasting! Another vibrant colour I own is my Rimmel Rita Ora 60 Seconds Varnish. It's fast drying, long lasting and is made into funky, quirky colours! 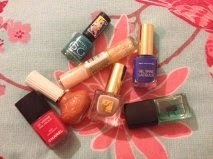 My last item in this haul is my Revlon Nail Art Sun Candy. A perfect duo to create glittery, girly nails easily!